Although less than a decade had passed since NASA launched its first satellite (Explorer 1), planners there were already dreaming of the day when direct satellite-to-home and satellite-to-car signals would be broadcast on a commercial basis. 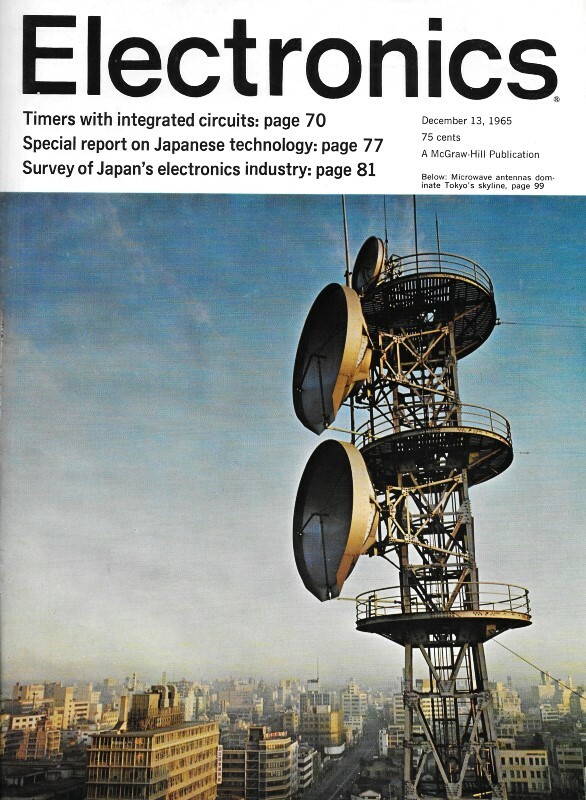 This 1965 issue of Electronics magazine notes an intention to begin with FM radio station airing akin to what we know today as satellite radio. Then, by 1977 the country would be treated to satellite-to-home television programming powered by a space-borne SNAP-8 (Space Nuclear Auxiliary Power) generator. Sirius XM Radio made its debut in 2001, while home satellite TV service began in 1976. Also mentioned is the USSR's fourth failed attempt to safely land an instrument package (Luna 8, aka Lunik 8) on the Moon. The U.S. managed a successful landing on its first try with Surveyor 1. Surveyor 2 and 4 crash landed due to a computer glitch, but Surveyor 3, 5, 6, and 7 landed safely. The National Aeronautics and Space Administration is showing increased interest in satellites that can broadcast radio signals directly to home receivers. The agency has requested industry proposals for studies of such direct-broadcast satellites. It is considering orbiting one or more such satellites late in this decade or in the early 1970's. The satellites would be able to broadcast programs throughout the world. Operating in the f-m mode, they would relay voice broadcasts to home or car radios equipped with directional antennas. NASA officials believe that direct television-broadcast satellites could also be orbited by 1977, using a Snap-8 nuclear-power supply with 35 kilowatts of power. High Cost of Money: Who Gets Hurt? When the Federal Reserve Board increased the cost of borrowing money this month to a 35-year high, its action hit particularly hard at two kinds of companies: those whose consumer products are sold largely on installment, such as television receivers, and those planning rapid expansion. One result of the increase in banks' discount rates - to 4.5% from 45% - may be to make small-business investment companies more attractive sources of loans [see p. 142]. SBIC's raise money through the sale of stock, so are not affected by the change in bank rates. The FRB says its move was designed not to slow down business expansion but to prevent the expansion from increasing too fast. United States airlines are in the market for a nationwide network for microwave communications. The network, expected to cost about $50 million, is planned by the commercial airlines' own communications company, Aeronautical Radio, Inc. (Arinc). Bids are due April 1. The airlines currently use the Bell System's bulk leased-wire communications service, called Telpak. The commercial airlines' move to their own communications network was prompted by two factors that threaten the future of Telpak. Critics of the bulk-wire service are battling it in court, contending that it's unnecessary and discriminates by offering lower rates to large users; in addition, the massive investigation of the entire Bell System, announced recently by the government, may result in the Federal Communications Commission's ordering substantial rate boosts for bulk users. Arinc estimates it would cost the airlines $12 million a year to operate their own communications network. Without Telpak, the airlines would have to spend about $65 million a year for telephone and teletype service. With Telpak, the charge for this year is estimated at $48 million. The Soviet Union failed in its fourth attempt to gently land a package of instruments on the moon. Soviet scientists indicated, however, that further efforts are planned. The crash landing on the moon, it is believed, was caused not by mechanical trouble aboard the spacecraft, Luna 8, but by unexpected characteristics of the moon. Some space experts in the United States suspect that the moon's surface may not be reflecting the spacecraft's radar properly. The radar is used to keep track of the distance between the moon and the craft; the retrorockets are triggered by radar signals as the spaceship approaches the moon's surface.